There are no visitor services in the park. Make sure you bring water and wear sturdy footwear. Long pants are recommended due to thorny brush on segments of some trails. Trail signs are not yet up so keep track of how you have come in so you can backtrack out of the park. Except in the coolest months, watch for rattlesnakes and always watch for poison oak – although neither is frequently seen in the most accessible parts of the park, they are part of it and need to be considered. No motorized vehicles are allowed in the park. 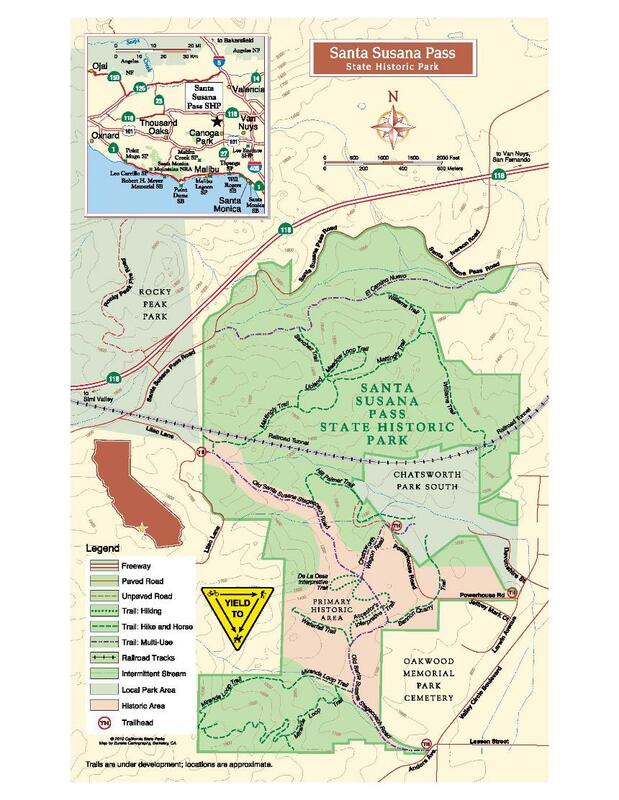 California State Parks has created a brochure for the park, including a map at the last page (which is posted below), and may be downloaded here. We recommend that you have a copy of the map to help guide you as you travel in the park. The main entrance used today is at the Larwin Avenue gate. From the 118 Ronald Reagon Freeway, take Topanga Canyon Boulevard south approximately two miles to Devonshire Street, turn right. Devonshire Street ends at the entrance to Chatsworth Park South, which presently is closed. The last street before Chatsworth Park South has a left turn lane but no stop sign, this is Larwin Avenue, turn left. The park entrance is about 200 feet to the right, just past the large electrical transmission lines. Alternative park entrances are near 9860 Andora Avenue near Lassen Street and Valley Circle Boulevard, and at 7700 Lilac Lane. Our park is a historic park – and as a State of California park, all plants, rocks, and structures are to be preserved. Please leave everything you find in the SSPSHP. Leave only footprints – and take only memories or pictures with you of this local treasure. To make a donation to support the Santa Susana Pass State Historic Park, you may do so using PayPal (click on Donate button below). Thank you!